A few minutes after the first pitch of game 5, my daughter came downstairs and asked why I was watching baseball so late at night. She had gotten out of bed to ask me something, and was a little disappointed she couldn’t watch with me. But she is young enough to not care that much – she still is mostly interesting in cheering to be like daddy, as well as the hot dogs and ice cream that come with attending games in person, not because she is invested herself. I tucked her in again, and then got back to the very adult business of agonizing over men that I don’t know playing a game in what look like pajamas. The NLDS finale was an amazing game, which essentially finished with a matchup between the best pitcher in baseball against one of the best hitters over the last year, for all the marbles (no offense to Wilmer Difo and his final at bat, but that was denouement). It was a true classic, and one that I will probably never want to see again because of the outcome, but one that was still incredible to witness. I won’t rehash much of the game, because there are places that do that better and more thoroughly. I will say it was disappointing but not upsetting if that makes sense. Both teams fought hard, and clawed their way back, one team just did a better job of it. The Nats had their opportunities, and didn’t capitalize enough. The send of Jayson Werth by Bob Henley will be remembered, and it was awful. But other than that, getting shut down with men on base by guys like Jansen and Kershaw is kind of what happens most of the time in baseball. The Nats also had some opportunities that seemed to get thwarted by some plain old bad luck – specifically I’m thinking of Anthony Rendon‘s 2-out liner in the third. It was maybe their hardest hit ball of the night besides the home run, it would have given the Nats a 3-0 lead, and it was hit right at the center fielder. Similarly with Murphy‘s liner in the 6th. This wasn’t a team flailing at every opportunity, not this time. Max Scherzer pitched a really good game (6.0 IP, 1 ER – that was the best start of the series by a large margin), and their bullpen, which had been very good all year, blew it. Maybe Dusty took Scherzer out too early, but he had labored for a couple of innings at that point, and the guys he brought in were his best relievers. There was nothing egregious about the move, just something to pick at in hindsight. The Nats fought, hit the ball hard, fell behind, and then fought back and almost won. Instead, they go home for the winter again after an NLDS loss. This time it was to a team that was favored going in to the series, for a number of reasons. The Dodgers had been banged up most of the year, but other than Hyun-Jin Ryu, there are now healthy. And the team with the biggest payroll in baseball (by about 15% over the next highest team) probably was considered the second or third best team in the league, behind the Cubs and maybe the Mets, going in to the season. Over the last month or so LA was finally healthy enough to play like they were supposed to, and the Nats, who played well all year but were never overwhelming, weren’t as good on paper. Losing Strasburg hurt, that was clear in games 3 and 4, and unlike the Dodgers, who lost Ryu in July, didn’t really have time to address it. Maybe if Giolito developed the way they had hoped this season, or if Joe Ross had been healthy enough to get 10 more starts worth of experience under his belt this year, that would have been enough. But that didn’t happen. The disappearance of 2015 Bryce Harper this season was an issue, and during the season they got by, but he was not himself. After going on the DL in August, he looked like he was coming back to form, hitting the ball hard for a few weeks. But by the end of September it was clear he was not right. Whether he is hurt, or was hurt and now has to fix his swing, they certainly missed his production this series. The biggest loss, though, might have been Wilson Ramos, although we’ll probably never really know. Lobaton was the hero in game 2, and that was huge, but other than that, their catchers went 2 for 18. I do wonder more about how his loss affected the starting pitching, which was not very good this series. If he had any value as a receiver over Lobaton and Severino, that could have been the difference in their 3 one-run losses. Looking back on this series and this season, I am not, as I said, particularly upset. I enjoyed watching this team immensely, but I never felt that they were the best team in baseball, or even in the National League. The playoffs have a good amount of luck and chance involved in the outcomes, and without serious benefits from those things, I didn’t see them beating the Cubs. As for the Dodgers, I feel that they were probably the better team, although the Nats still almost beat them. If anyone can beat the Cubs, I’m guessing it is the Dodgers, but I don’t think they will. I am, however, still disappointed. I wanted them to win that first playoff series. I wanted people to stop talking about stupid curses and to stop using the word “choke” to the point that it no longer has its intended meaning. But mostly, I wanted another week of baseball with this team, even though I had no illusions of anything beyond it. Now, the long offseason begins, and the Nats have questions to answer. As of today, they don’t have a starting catcher on the books, although they could name Severino to that spot, I’m not sure he’s the answer yet. They don’t have a closer, and the bullpen was good but probably still needs work. They have a good rotation but it is incomplete. They have to decide where to put Trea Turner, and if they keep him at center, if they want to find someone else to play shortstop. They probably just have to cross their fingers and hope Bryce becomes Bryce again. There may not be a ton of moves to make, but there are certainly things that need to be addressed. After the game ended, I checked on my kids, sleeping soundly at 1:00 in the morning. After my initial despair after the loss, I was happy again. This was a fun season, and we got to watch it together. I realized that despite this loss, come next summer, I will get just as much enjoyment out of every win as I did this summer. Hope springs eternal, and with baseball, spring brings that hope. 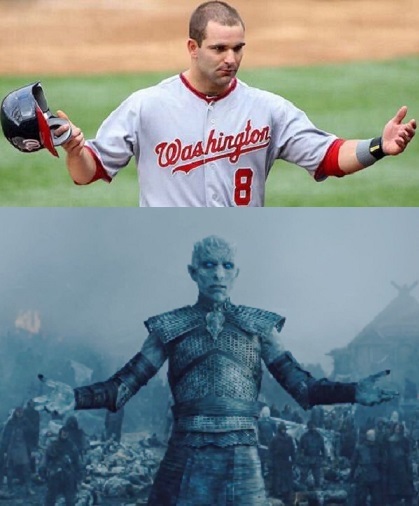 In the meantime, winter is coming, and the Nats have work to do.